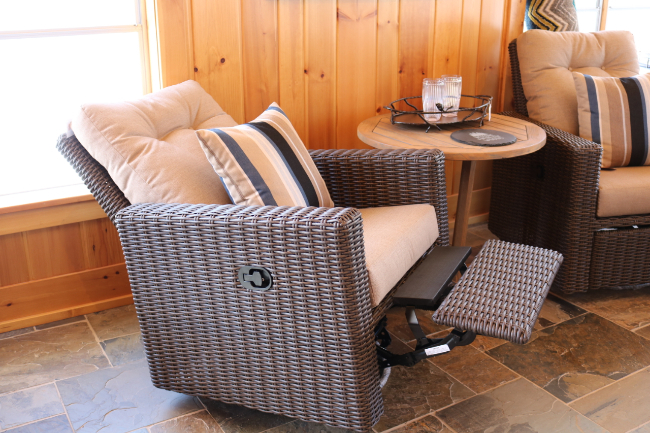 We have spectacular news… sitting in the great outdoors doesn’t mean you have to be uncomfortable anymore! 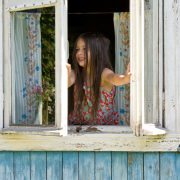 Rust, mold, mildew — not to mention all those other wholesome, character-building features of our childhood — are now memories. 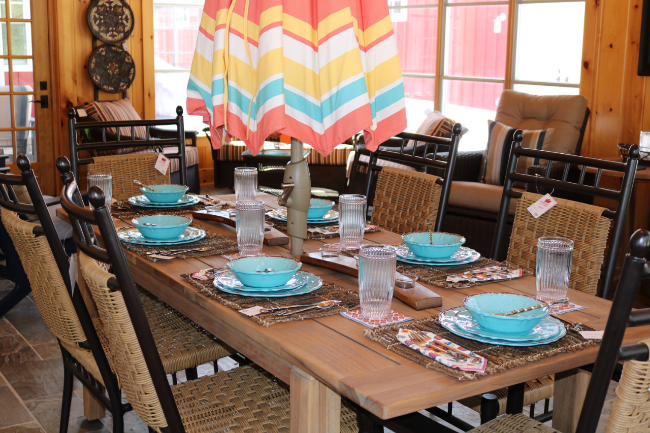 And we have to say, when it comes to outdoor furniture improvements, we’re fully on board! Here are some of the latest innovations that will change how you enjoy this spring and summer. You no longer have to suffer the discomfort (and fragility) of aluminum folding chairs. Think plush cushions and pillows. A soft landing for relaxing the rump. Chairs and sofas you can really sink into. The future is here. 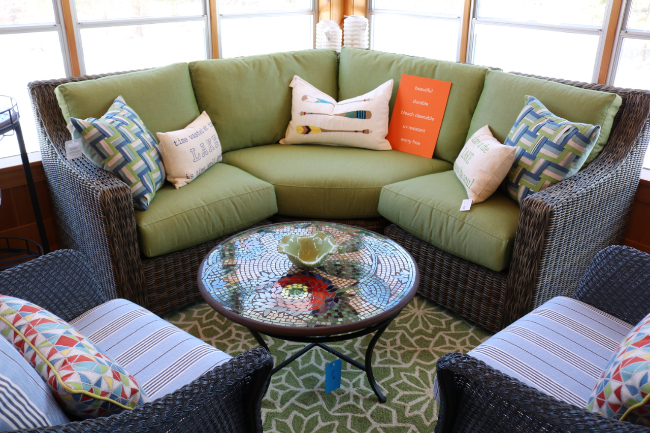 More than comfy, outdoor seating is now made in weather-resistant fabrics, cushions and rust-proof frames. What’s not to love?? The best part is that you can wash them down after the summer is over and — ta da! — indoor furniture. No need to dig up the yard to have a warm, comforting fire for you and your family. 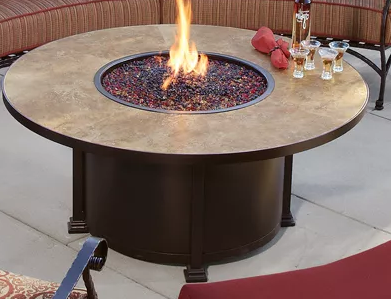 Wood-free fire tables come in all shapes and sizes, use propane or natural gas, and can be turned on or off as needed. We know it’s not the fire pit of our childhood, but you can’t deny they’re practical, safe for our youngest grandkids (and the environment), and pretty darn neat. Questions about furniture? 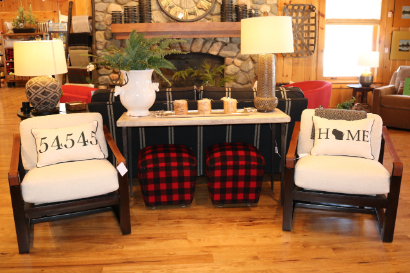 Need a hand selecting something that will work well with your lake home? You know right where to find us… and we’re having a SALE! 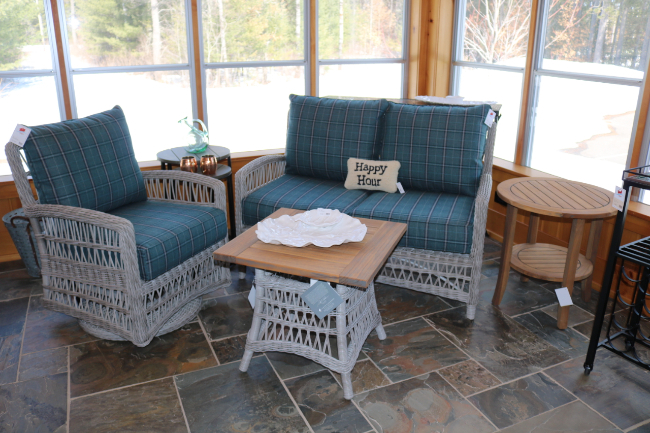 As mud season season starts up in northern Wisconsin, does your to-do list include opening up your lake cabin? …You betcha! 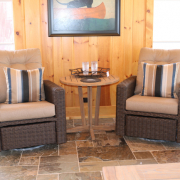 Last year, we put together a great guide for bringing your lake house back to life after winter, so why reinvent the wheel this year? 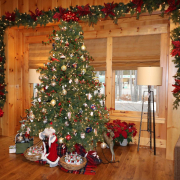 Instead, we’re going to share 7 decorating tips to get those creative juices fired up and your cabin looking fresh and new! 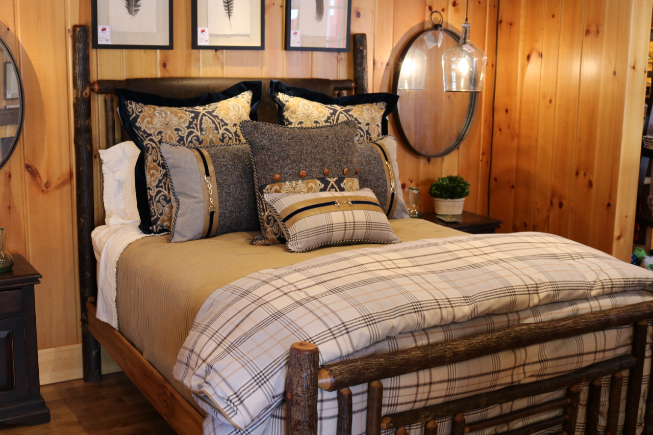 We love the lake house/cabin vibe, but if you want to add a touch of elegance, some ornate, traditional patterns are the way to do it! 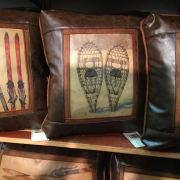 You could easily incorporate patterns into bedding, window treatments, or upholstery, but we especially love these fancy pillows. Not only do they look like a million bucks (without costing it), but you can easily swap them out with the seasons. Plus, they’re small enough not to get too distressed with the daily come-and-go of lake life. Love it! Here’s a designers’ trick to bring some visual interest into your living or dining room… mix up the seating! Here, we paired handcrafted wooden chairs with high-backed upholstered ones. The effect is casual but elegant, interesting but not overdone! 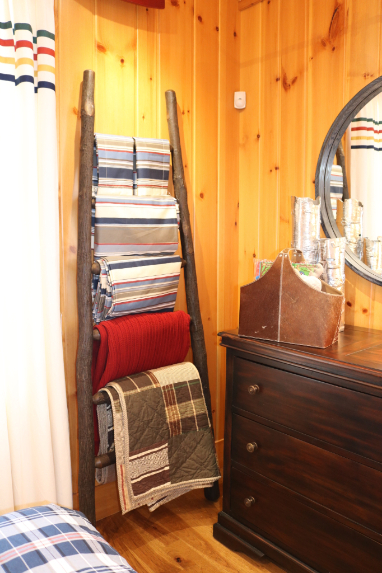 Have you ever thought of using a ladder as blanket or towel storage? It’s functional and decorative! 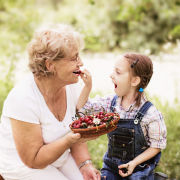 If you have grandkids running around, just make sure to keep an eye on them. Those little rascals will see this ladder as an instant playground! 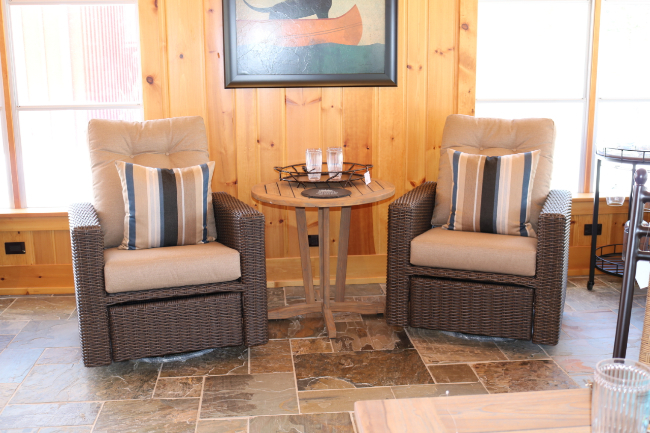 Lake House Decorating Tip 4: Ottoman or Coffee Table? Both! 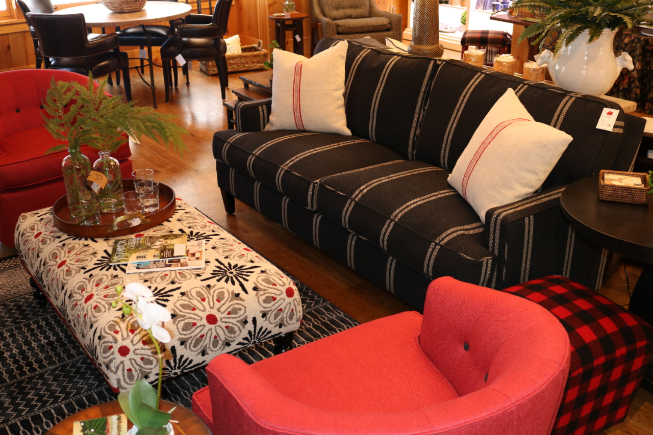 We love extra-long ottomans, because they can double as coffee tables! Just get a nice tray for drinks or snacks, and you have a stylish, functional living room on your hands. 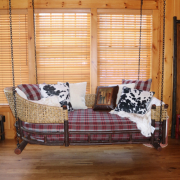 Whether your future includes a cozy swing or not is up to you, but if you haven’t thought about your porch yet, consider spicing it up for comfort. Your summer on the lake will be all the merrier for it. 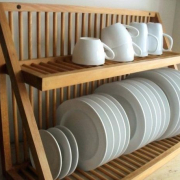 For your larger items, sometimes simple and functional is best. 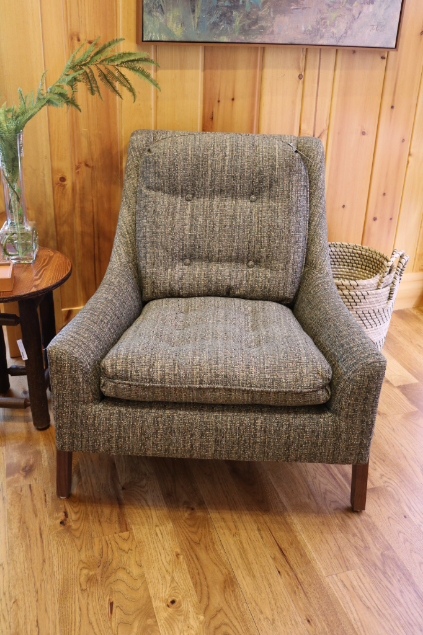 This armchair is sturdy, has great neutral upholstery for hiding years of use, and is a joy to sit in… that’s sounds like a perfect combination to us! You can always accessorize elsewhere to keep the space feeling lively. 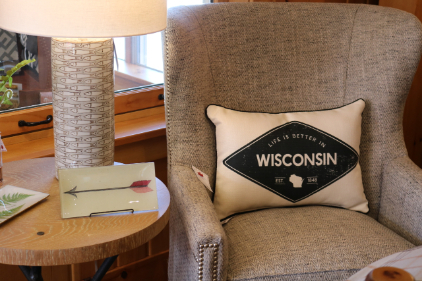 Lake House Decorating Tip 7: Add Wisconsin Pride and Some Smiles! That’s it for today, but we’ll be back next month with more helpful advice. 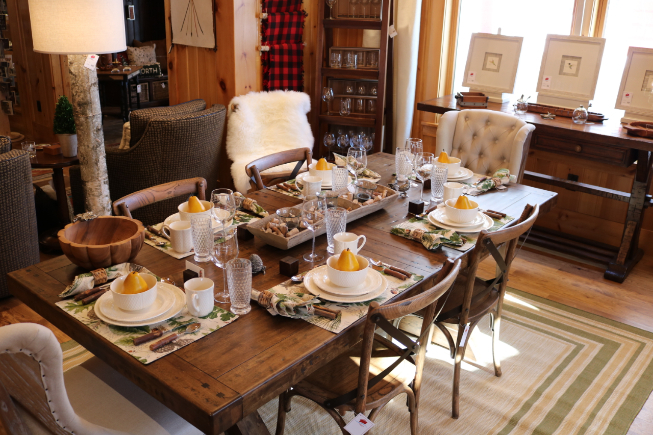 If you need a little decor for your space, or a team to redesign it, we’re ready to help! Just stop by, give us a call, or sign up for our monthly lookbook below. We just returned from another trip to market! This one was in Atlanta, and yes, we got up to our usual shenanigans while on the road — uncontrollable laughter, plenty of oohs and ahhs, and of course, bringing items back to our store for you! In this month’s post, we’re keeping it practical: storage solutions. 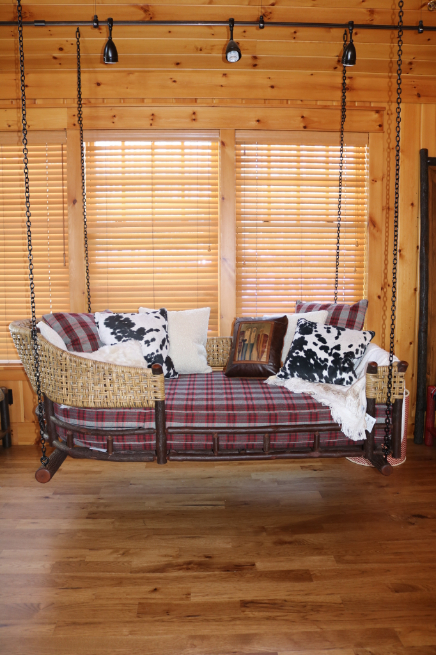 It’s not the most romantic topic, but everyone has and needs storage in their homes (that goes double for WI lake homes!). Sign up to receive our monthly look book!